Honestly, you can do it. You pay for TradeStation why not learn how to use one of its most powerful features? EasyLanguage is easy if you know how to get things started. This tutorial gets you started with five sub-tutorials: Donchian (2), Keltner, Bollinger and Day-Trading. Each tutorial starts with a blank slate and shows exactly what to type into your TradeStation Development Environment (editor). Each line of code is fully explained; why you need it and what is its purpose. 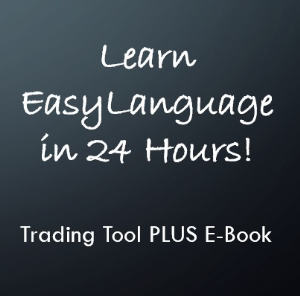 This first four tutorials are designed for beginners and the last tutorial on Day-Trading is designed for both beginners and somewhat experienced EasyLanguage users. You can handle this, right? From here we build and instruct how to add profit objectives, protective stops and how to make changing inputs as simple as possible. The last tutorial introduces the idea of utilizing intra-day data and how one must switch gears and start thinking in a much smaller time frame. Day Trade Algorithm – Buy the high of the first 30 minutes [A la Jake Bernstein] and sell short the low of the first 30 minutes. Allow up to three entries – you will catch the trend, eventually right? Place a protective stop (don’t want to risk too much now) and a profit objective (make it big to make it worthwhile.) Don’t allow entries too late in the day. You probably could, given enough time. However, with this tutorial you can program it, understand it and test it within 10 minutes. Once you understand the concepts, you should be able to program almost anything you can imagine.